Now brace yourself for Ultra-High Definition TV, also known as UHD or “4K.” It’s tempting to assume that means “4 million pixels,” but in fact the UHD standard is 3840x2160 or 8,294,400 pixels per frame… four times the pixels of HD TV. Early this year, I bemoaned the sky-high prices of 4K sets. The good news is that falling prices are the biggest factor in unit sales growth, according to the folks who track the 4K market. Mid-range sets were selling for $3,000 in 2013; today, the same features and more are available from multiple manufacturers for well under $1,000. Size is not all that matters. The M-series includes a full connectivity package: WiFi, Ethernet, HDMI 2.0, HDCP 2.2 compatibility and full HVEC and VP9 functionality. It doesn't matter if you can't unravel all those acronyms. The upshot is that whatever the source of your 4K content, you’ll be able to access it. As you move up the price scale, features become a bit more obfuscated. Take nano-crystal color technology, for instance (or its less descriptive but more consumer-friendly name, Quantum Dots). Basically, it enables display of a much wider range of colors and deeper depth of color on an LCD 4K screen. The frustrating thing is, every manufacturer has its own name for this tech. Sony calls it Triluminous. Samsung calls it SUHD, and LG Electronics went with Prime UHD. Television specs are the only thing more inscrutable than telco wireless plans. Okay, we've covered the under-the-hood stuff. Now what about the action that happens on that beautiful screen? Cable, over-the-air TV broadcasters, and DVD/Blu-Ray producers are not cranking out content in 4K format yet. Stay tuned, as they say. Currently, 4K content is available only via the Internet. Because 4K content is four times bigger (in terms of bytes) than standard HD, the whole video delivery industry is scrambling to adapt. Netflix currently offers a limited selection of 4K content, including TV shows such as “House of Cards” and movies on the order of “Smurfs 2.” However, Netflix can stream 4K only to TVs made by Sony, LG, or Samsung, and you must be a tier-four family subscriber to get 4K programming. Amazon Instant Video is also offering streaming 4K content. You'll need a compatible 4K Samsung, LG, Sony or Vizio set to join the fun. YouTube is streaming 4K for free (with Google ads, of course), and users are uploading 4K content. The catch here is that Google developed its own, royalty-free code called VP9; make sure your 4K TV supports it if you want to watch 4K YouTube videos. Movie and TV producers are shooting some of their works in 4K now. It will be a while (probably mid-2016) before live TV (sports, news, etc.) is available in 4K resolution. But in addition to the online content mentioned above, we can expect to see 4K Blu-Ray versions of films and TV programming in time for the 2015 holidays. My current TV sets are working fine, and I have no burning desire to count the number of pores on Vin Diesel's face. Personally, I’m going to wait at least until the end of the year before seriously shopping for 4K gear. By then, prices will probably have dropped even more (think Black Friday and holiday sales), and a lot more content will be available. Most recent comments on "Is It Time For 4K TV?" With the state of broadband access in this country, all I can say is: "what a waste." I have access to 1.5Mb/sec dsl and other than all too quickly throttled, overpriced satellite, that's it. If I had a tower, or was willing to put something in a tree I could get a 4G signal. On a good day I can watch a couple of Netflix shows before the bandwidth mysteriously shrinks to below 0.1Mb/sec- every night around 8pm. The phone company doesn't care in the least. It's been going on for the 4 or so years since I was able to give up satellite. Thanks for the excellent and clear article, Bob. Having just been forced to upgrade my desktop monitor to what I suppose would be termed 1080p (23 inch, 1920 x 1080 pixels), I don't see myself upgrading until this one stops working. My previous monitor was 19 inch and 1440 x 900 and lasted 6 years! Bleeding edge ? I thought the proper phrase is either "leading edge" or "cutting edge", LOL. I have ordered a new model LT-42UE75 JVC without all the bells and whistles for 399 from Groupon. It should do everything the more expensive sets do. I have a great PC dedicated to my home theater system so I have al the "accessories" including the Amazon Prime Stick and internet access. I can easily up date and I have 14 days to return it if I am not happy. Look up the reviews of this very new model....seems too be worth looking into. Nope, not interested. I am happy with my HDTVs.I have a good selection of DVDs, both regular and Blu-ray, they will play on my HDTVs. However, I am so pleased that the 4K TVs, are going down in prices ... Because, that means that HDTVs are going down even further, in their prices!!! I just bought a 40" Spectre HDTV, 1080p, 3 HDMIs, but, it is not a SmartTV, with built-in WiFi, for $229! Now, to me, that's a great deal. I didn't need the WiFi aspect, I already have a WiFi Router, and my grandson has a XBOX One, which does have WiFi and connects with my router. He can get all of the WiFi Apps, on his XBOX One. I use a NeoTV for another one of my HDTVs, for the same reason. My next TV will be an OLED TV, as it's the closest thing to a plasma TV, the technology of which is no longer being produced. Plasma has consistently beaten LCD technology when it comes to picture quality. 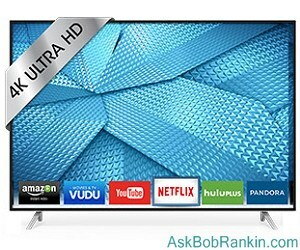 I recently viewed the latest Samsung ultra 4K 8000 series TV with a real 4K feed and came to the conclusion that the quality of the picture was not much better than my 9-year old Hitachi flat screen TV (1080-i) using the latest state-of-the art cable box from Comcast. Oddly enough I was satisfied with wooden boxed 21” color console set. The only difference in the picture I am watching today is (my age is showing) that now advertisements are plastered over the picture. When I purchased a big, flat screen I didn’t realize the benefit was for advertisers. I actually don’t see a larger picture than before because the large icons in each corner and the banner at the bottom of the screen leave me with a 21" viewable picture. Do you know what the difference is between the television industry and a mugger? The television industry doesn’t need a gun. With the exception of the “Station Identification” required by the FCC, I never agreed to pay to have advertisements block any part of the picture I am paying to view. And I certainly did not agree to pay for a 70% increase in commercial messages during a program; it's ‘take-it-or-leave-it!’ So I am comfortable in saying I’m not paying to see and hear more commercials with better sound quality in improved depth of color! At the Electronics show in Vegas last month, a Japanese company, maybe Sony, had 8k tv's. They made 4k look silly. 8k looks so natural - what's on the screen looks like it's real and right in front of you. I got an HD TV for Christmas. The picture is great, so don't see the need to upgrade for a couple years. I had to buy a new TV since my Samsung HD 46" LCD TV started getting vertical lines that could only be corrected by jiggling the cables in back. Got very irritating. I figured if I was going to buy a new TV, I may as well go for the 4K so I bought a Sony 55" bravia with the Triluminous display. It's really stunning. I can't wait for football to be in 4k. I'll bypass buying the "sizzle" for now and wait until the "steak" arrives. Our main cable/Netflix/dvd/Blu-Ray viewing LCD (Vizio) is just fine for its size:viewing distance ratio in our family room. Any better perceived resolution would just be a waste. 4K a waist out here in the country. internet comes in by Hughes Net so it would take several days to use up a months worth of download. after the second day of the month we would be in the 500kb range for the next 28 days. We still have one of the 1998 HDTVs made by Hitachi. A 55" rear projection unit without HDMI and it still works fine. We also have a 55" Toshiba HDTV DLP technology which I'm getting tired of replacing bulbs in, but it still does the job. The market for TVs is in the dumpster so they are trying to stimulate sales. First they tried pushing 3D TVs and that didn't work. Now they're trying 4K TVs to get people to buy TVs again. All very nice, but when the bulb goes again in that Toshiba, I'll replace it with a 1080P HDTV that has no voice command, internet connections, or other gimmicks, etc.. I see no real advantage to 4K over HD. I know, I'm starting to sound like an old curmudgeon but I don't have Netflix or any other streaming online service. Don't need them as I still have several years worth of DVDs I have yet to watch. TV's. They are working well and I have no desire to upgrade. Ironically, the three "old fashioned" TV's are working well in a friend's house. The "price" was right for my friend. This constant "better and "better" is not for the average person. Sitting down and watching a good program is still what it's all about. I do have Netflix,too. About a year ago, I purchased a large HD plasma Samsung TV. I don't think anyone is making plasmas any more. I still think that for HD, plasmas STILL look better then UHD LCDs/LEDs. The plasmas have deeper blacks and greater viewing angles. Maybe in a few years, 4K will match the CURRENT plasma picture quality (other than pixel density). Maybe this is another Betamax VHS situation. Beta was a better format then VHS. Sony held it as a proprietary format and, in general, Betamax players were more expensive the VHS. Eventually VHS won out. I wonder what will come after 4K? Samsung introduced an 8K (SUHD) model at CES this year. Maybe by the time I'm ready to give up my plasma, I can skip the 4K phase. I would rather have the snowy TV(antenna) from the 1970's and the analog cable of the 1980's, compared to today. At least there was a drama that lasted for 20 minutes between commercial breaks. Now I have 200 channels and have to keep changing the channel, because of the excessive commercial breaks. What I find interesting is the sale of 4K video cameras and webcams. One can make their own videos in stuning details. Also, instead of having to buy a property along the shore, one could put an 4K camera and stream down the video to a 4K TV on the wall, so there you get an excellent ocean front view!